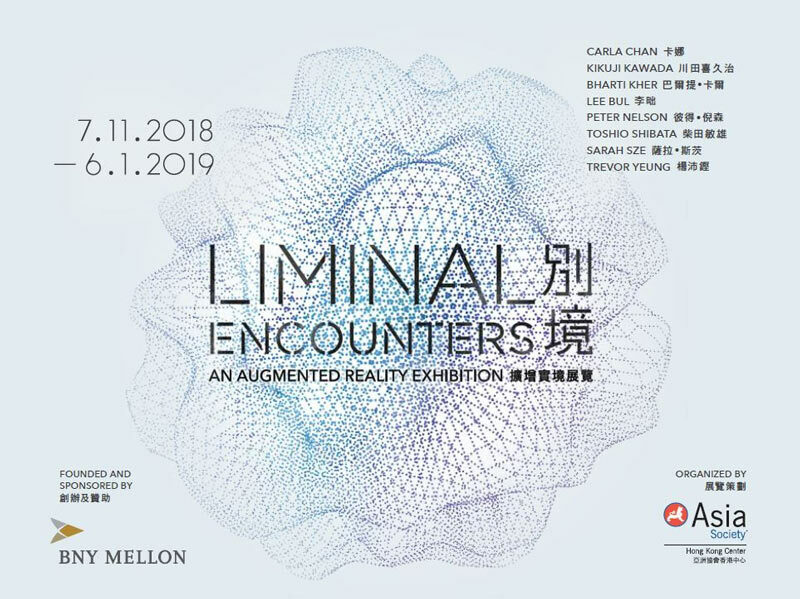 Liminal Encounters is an outdoor art journey that explores the ways technology integrate the virtual world with our real life through artworks that make use of augmented reality (AR). As we are used to accessing information digitally in all aspects of life, the gap between the real and virtual grows closer every day. The three themes of the exhibition reflect the transformation of nature and the city, the impact of virtual information and the place of the individual within a world in flux. The journey includes virtually the works by Kikuji Kawada, Bharti Kher, Lee Bul, Toshio Shibata and Sarah Sze from the BNY Mellon collection, as well as three on-site commissioned installations by Carla Chan, Peter Nelson, and Trevor Yeung. Through AR, the exhibition encourages the audience to view their surroundings from new perspectives. Born 1989 in Guangdong, China, Chan is a Hong Kong contemporary artist based in Berlin. She obtained her Bachelor of Arts Degree from the School of Creative Media, City University of Hong Kong. Working with a variety of media including video, installation, photography and interactive media, she considers media art as a medium with infinite possibilities for artistic expressions. Chan’s creations often toy with the blurred boundaries between reality and illusion, figure and abstraction. Her works focus on the theme of ambiguity in nature, bridging natural transformation and unpredictable computer algorithms. In 2017, Chan received the Toy Berlin Masters Award and is the finalist of Contemporary Talents 7th Edition, François Schneider Foundation’s Contemporary Art Centre. Kikuji Kawada was born in Japan in 1933 and grew up during the Second World War. He lived his youth in the shadow of the Hiroshima atomic bombing, and his photography often reflects on experience in post-war Japan. He is one of Japan’s most celebrated photographers, co-founding the VIVO collective in 1959 with Akira Satō, Eikoh Hosoe, Ikko Narahara, Akira Tanno, and Shomei Tomatsu. He received the Lifetime Achievement Award from the Photographic Society of Japan in 2011. His works are collected worldwide, including by the Tokyo Metropolitan Museum of Photography, Tokyo; San Francisco Museum of Modern Art, San Francisco; Museum of Modern Art, New York; Center for Creative Photography, University of Arizona; and the Centre Georges Pompidou, Paris. Bharti Kher was born in London in 1969 and grew up in New Delhi, India, where she is currently based. Her cross-cultural identity and experience underscore her works. Her practice consists of four distinct but interrelated dimensions including bindi works, hybrids, ready-mades and sculptures that explore the body, border and cultural politics. She is collected by prominent institutions such as the British Museum, London; Tate Modern, London; Devi Art Foundation, New Delhi; Walker Art Center, Minneapolis, Minnesota; Guggenheim Abu Dhabi; and LEEUM Samsung Museum of Art, Seoul. including the Los Angeles County Museum of Art; M+, Hong Kong; Mori Art Museum, Tokyo;Museum of Fine Arts, Houston; National Gallery of Victoria, Melbourne; National Museum of Modern and Contemporary Art, Seoul; Seoul Museum of Art, Seoul; the Solomon R.Guggenheim Museum, New York; Tate Modern, London; and Walker Art Center, Minneapolis. Peter Nelson (b.1984) is a visual artist who works between painting, animation and digital media. Across these disciplines, he is engaged in a prolonged consideration of the history of landscape images, how they are remediated by technological shifts, and how these shifts absorb and reflect changes in our relationships with the physical environment. He has been working between Australia and East Asia for the past 10 years and has undertaken residency projects with Taipei Artist Village, Organhaus Chongqing, and Sydney Serial Space. He is currently undertaking a Ph.D. with the School of Creative Media at the City University of Hong Kong, researching the historical significance of computer game landscapes. Toshio Shibata was born in 1949; he was originally trained in painting in Tokyo but found an interest in photography in the late 1970s studying in Belgium. He has been exhibited internationally since 1971, and he was given a mid-career retrospective at the Tokyo Metropolitan Museum of Photography in 2008. In 2013, the Peabody Essex Museum mounted a solo exhibition of his work entitled Constructed Landscapes which featured 28 of his large-scale prints. His work is found in major museum collections including the Metropolitan Museum of Art, New York; Museum of Fine Arts, Houston; Museum of Contemporary Art, Chicago; Sprengel Museum, Hannover; and Centre national de la Photographie, Paris. Born in Boston in 1969, Sarah Sze currently lives and works in New York. She received a BA from Yale University in Connecticut in 1991 and an MFA from New York’s School of Visual Arts in 1997. She is a 2003 MacArthur Fellow. Sarah Sze’s work attempts to navigate and model the ceaseless proliferation of information and objects in contemporary life. Incorporating elements of painting, architecture, and installation within her sculpture, Sze investigates the value we place on objects and explores how objects ascribe meaning to the places and times we inhabit. Sze’s works are found in important private and public collections worldwide, including those of New York’s Guggenheim Museum, Museum of Modern Art, The New Museum and Whitney Museum of American Art; Museum of Contemporary Art, Chicago; Walker Art Center, Minneapolis, Minnesota; Boston Museum of Fine Arts, Boston; High Museum of Art, Atlanta, Georgia; Los Angeles Museum of Contemporary Art, Los Angeles; and 21st Century Museum of Art in Kanazawa, Japan. Trevor Yeung was in 1988 in Guangdong Province, China. He graduated from the Academy of Visual Arts at Hong Kong Baptist University in 2010, and currently lives and works in Hong Kong. Yeung’s practice uses botanic ecology, horticulture, photography and installations as metaphors that reference human relationships. Recent biennials and exhibitions Yeung has participated in include “Cruising Pavilion” at the 16th International Architecture Biennale (Venice, Italy, 2018), the 38th EVA International Biennale (Limerick, Ireland, 2018), the 4th Dhaka Art Summit (Dhaka, Bangladesh, 2018),“CHINA 8 –Paradigms of Art: Installation and Object Art” (Osthaus Museum Hagen, Germany, 2015) and the 10th Shanghai Biennale (China, 2014).